"Fred’s...was one of the best book presentations I have ever seen....I heartily recommend him as a speaker. "— Taryn Edwards, Mechanics’ Institute Library, San Francisco, 2012. "His insight and good humor make a most interesting and entertaining speaker as well as a widely respected author on Japanese history and culture.” —Jim Mockford, former chairman, Friends of MacDonald society, LinkedIn, July 24, 2008. "Schodt is a humble and nuanced speaker. "—Ryan Sands, Electric Ant, 2009. [To contact Fred about speaking engagements, send email to [ fred (at mark) jai2.com ],or write to Frederik L. Schodt, 428-B Carl St., San Francisco, CA 94117 ]. Place: University of San Francisco, Center for Asia Pacific Studies, Kalmanovitz Hall, Professor John Nelson's graduate seminar. Title: "Popular Culture Waves: The Past, Present, and Future of the J-Pop Engine." Place: Chris Scott's Japanese class, at The Nueva School, 131 E 28th Ave, San Mateo, CA 94403. Title: Henry Kiyama and the Four Immigrants Manga. Place: Kinetech Arts, at Counter Pulse, 80 Turk St., San Francisco, CA. Title: Featured Artist Presentation, with Paige Starling Sorvillo. Place: Drew High School, San Francisco, Jason Whiton's class. Place: Washington D.C., Marriott Wardman Park Hotel, AATJ (American Association of Teachers of Japanese) 2018 Annual Spring Conference. Title: "Edutainmentification" in Japanese Manga," as part of a panel on "Thematic Approach in the Language Classroom Using Manga," with Prof. C.J. Suzuki (Baruch College & CUNY) and Hideki Hara, head of the Japan Foundation Los Angeles. Place: Drew High School, San Francisco, Drew Writer's Festival, Jason Whiton's class. Place: Tokyo, Japan National Press Club/東京、日本記者クラブ. Title: (Acceptance speech, in Japanese, at the 2017 Japan Foundation Award ceremony). Place: OTAKON. Walter E. Washington Convention Center, Washington D.C. Title: Creation of "The Osamu Tezuka Story"
Title: From Manga to Musical:The story of "The Four Immigrants Manga". Place: SWET Book Fair and Special Lecture, Shimazono House, 3-3-3 Sendagi, Bunkyo-ku, Tokyo. Place: Alumni House, University of California, Berkeley. Title: "My Asia," commencement address to East Asian Studies department graduates. [Not open to the public]. Place: Terrace Room, Cohen Hall, University of Pennsylvannia, Philadelphia, Penn Forum on Japan Colloquium, hosted by the Center for East Asian Studies. Title: 「～世界に日本マンガを紹介して40年～フレデリック・ショット講演会」（第10回日本国際漫画賞 関連イベント、モデレーターが椎名ゆかり）. ("Talk by Frederik Schodt, who spent 40 years introducing Japanese manga to the world.") Event in conjunction with the 10th International Manga Award, moderated by Shiina Yukari. Title: 第10回日本国際漫画賞記念シンポジウム (Commemorative Symposium in Conjunction with the 10th Anniversary of the Japan International Manga Award") In Japanese. Place: Madeleine Graham's 7th & 8th grade classes at The Odyssey Middle School, San Mateo, California. Title: Acceptance remarks for lifetime award, at Ranald MacDonald Award Ceremony, October 11, 2016. Place: Piedmont Center for the Arts, Piedmont, California. Title: "An Introduction to Osamu Tezuka" (as part of the book launch party for The Osamu Tezuka Story: A Life in Manga and Anime, by Toshio Ban and Tezuka Productions, published by Stone Bridge Press, Berkeley, California, July, 2016. Place: University of California, Berkeley, ORIAS (Office of Resources for International and Area Studies). Title: "Japanese Pop Culture in North America: From Woodblock Prints to Acrobats to Manga and Anime," part of "Pop Culture in World History" conference. Place: The University of San Francisco, Fromm Hall - FR 111 - Broad Conference Room. Title: The Continuing Allure of Hayao Miyazaki (with Beth Cary). Place: Drew High School (Lingerr Senghor's 9th grade class). Place: Meiji University, Nakano Campus, Tokyo. Title: 「日米をまたぐストーリー漫画の始源　～アメリカに渡った日本人漫画家『木山義喬』～」 (小野耕世との対談）(Origins of Story Manga, Straddling Japan and America-- On Henry Kiyama, the Japanese Manga Artists who Travelled to the America"; with Kosei Ono..
Place: The Asian Art Museum, San Francisco. Title: Henry Yoshitaka Kiyama and the Manga-Comics Nexus. Title: (With Beth Cary) "The Continuing Allure of Hayao Miyazaki," along with planned screening of "The Kingdom of Dreams and Madness". Title: "Professor Risley and the Imperial Japanese Troupe: How an American Acrobat Introduced Circus to Japan--And Japan to the West." . Title: "Two Unheralded Transpacific Pioneers-- Native American Explorer, Ranald MacDonald, and Comicbook Artist, Henry Yoshitaka Kiyama." . Title: "Japan as “The Robot Kingdom." For more information click HERE. Title: “The Continuing Allure of Hayao Miyazaki" (with Beth Cary). Place: Van Hise 104, The University of Wisconsin, Madison, Wisconsin. Title: “Osamu Tezuka and Astro Boy: Creating the Modern Manga/Anime Complex”. Place: College of Business auditorium, The University of Wyoming, Laramie, Wyoming. Title: “Henry Yoshitaka Kiyama and the Manga-Comics Nexus”. Title: “Anime talk: Fred Schodt on Osamu Tezuka + Rare Animations + Q&A”. Reading at school assembly writers' panel, and talk to classes of English teachers Lingerr Senghor and Doug O'Keefe. Title: "Four Immigrants Manga: A Japanese Experience in San Francisco, 1904-1924," a talk with translator Frederik L. Schodt, and with Peter Goodman, publisher and president of Stone Bridge Press. For more information click HERE. Title: "The Continuing Allure of Hayao Miyazaki", with co-translator Beth Cary, and Miryam Sas (talk moderator). More information click HERE. Place: Auberge Royal Versailles, Montreal, Quebec, Canada. Title: "Risley and the Imperial Japanese Troupe"
Subject: Professor Risley and the Imperial Japanese Troupe. Details here.For report on talk, click here. "Professor Risley and the Imperial Japanese Troupe: How an American Acrobat Introduced Circus to Japan—and Japan to the West"
Venue: Shibuya Kyoiku Gakuen (SKG) 1-21-18 Shibuya, Shibuya-ku, Tokyo 150-0002. (Access MAP). 15:00pm "Professor Risley and the Imperial Japanese Troupe"
Tuesday, 5:00 p.m. | USF Main Campus, Fromm Hall, Maraschi Room. Open to the public. 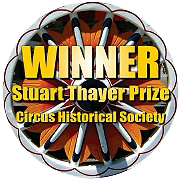 "Professor Risley and the Imperial Japanese Troupe: How an American Acrobat Introduced Circus to Japan—and Japan to the West"
Professor Risley and the Imperial Japanese Troupe awarded CHS's Stuart Thayer Prize. Jason Whiton's class at Drew School, San Francisco. Giant book launch party! 7-9pm, with acrobats, piano recital, readings, and music by reunited band, Just Friends. The Mechanics' Institute Library, San Francisco. 6pm, 4th flr. meeting room. "Professor Risley and the Imperial Japanese Troupe: A Lost History, and a Lost Page from San Francisco’s History"
"Professor Risley and the Imperial Japanese Troupe: How an American acrobat introduced Western Circus to Japan, and Japan to the West." Foreign Correspondent's Club, Tokyo, Japan. "Localization and the Grammar of Manga." ASPAC 2012, Asian Studies on the Pacific Coast, Gonzaga University, June 15-17, 2012, "Asia at the End of History & Christian Asia" 2012 Keynote: "Transpacific Japonisme, Past, Present, and Future." Jason Whiton's class at Drew High School, San Francisco. Philosophy S249, Quadrangle Building,University of Sydney, Sydney, Australia. "Creation of a Manga/Comic Hybrid." Talk at OSA (the Oriental Society of Australia). "Henry Kiyama and the Four Immigrants Manga"
"Manga as 20th Century Ukiyo-e: The Past, Present, and Future of the J-pop Engine." --Keynote at the Second Asian Studies Program Symposium-- Reflections on Modern Asia: From Manga to Confucius. Kanrin Maru 150th Anniversary Special Teacher’s Workshop. “Early Encounters Between the United States and Japan,” with Professor Peter Duus and Gary Mukai. Yours Truly talks on Ranald MacDonald. Rm. 142 Dwinelle Hall, University of California, Berkeley.
" The Allure of Hayao Miyazaki, " with Beth Cary, for Dr. Miryam Sas' class on animation. Asian Art Museum, San Francisco, Civic Center. "Creation of a manga-comic hybrid." 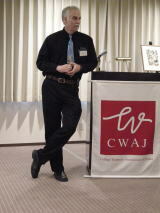 Keynote address at "Intercultural Crossovers, Transcultural flows: Manga/Comics." Ono Azusa Hall [小野梓記念講堂], Waseda University, Tokyo, Japan. Panel discussion during 76th International P.E.N. Congress, Tokyo, 2010, with Takayuki Matsutani, Satonaka Machiko, Eto Mori, on how manga and anime have depicted the environment, with emphasis on Osamu Tezuka. Kabuki Hotel, San Francisco, CA. "My Japan"--Keynote speech at JET (Japan Exchange & Teaching) Program Pre-Departure Orientation session. Temple University, Japan Campus, Tokyo, 12:30pm. "Manga as 20th Century Ukiyo-e: The Past, Present, and Future of the J-pop Engine," Keynote address at "Politics of Popular Culture" conference. "The Allure of Hayao Miyazaki," with Beth Cary. "Tezuka, Astro Boy, and the Manga/Anime Revolution"
University of Massachussetts, Amherst,Herter Hall 227, 5pm. "Localizing manga in America; localizing comics in Japan"
Talk on the history of manga translation/localization. Freer Gallery, Smithsonian Institute, Washington D.C.
Osamu Tezuka anime retrospective at the Freer Gallery, Smithsonian Institute, Washington, D.C.
"The Allure of Hayao Miyazaki". In auditorium of San Antonio Museum of Art. University of California, Davis, 1309 Surge III. "Osamu Tezuka and Astro Boy"
Center for International Studies, University of Missouri, St. Louis, Missouri, J.C. Penny Auditorium, North Campus. Anime at UMSL: "Postmodern Japan comes to St. Louis--"a free day-long symposium where experts in the field of Japanese popular culture will share new and exciting research." Yours Truly on panel on Paprika, with Roland Kelts, Patrick Drazen, Jeni Prough, and Christopher Born. Center for Japanese Studies, University of California, 2223 Fulton Street, 6th Fl., Berkeley, California. 10:00 AM - 12:00 PM. Hayao Miyazaki Symposium. Leading scholars of Japanese popular culture, literature, and film will discuss Hayao Miyazaki's work and his international influence in a roundtable panel discussion. Yours Truly is a "discussant." Otakon, Baltimore Convention Center, Maryland. Appearances on Saturday and Sunday. Nibei Foundation, Los Angeles, California. "Osamu Tezuka, Astro Boy, and the Manga/Anime Revolution"--presentation to Japan Studies Group. Japan Foundation, Los Angeles, California. "Osamu Tezuka, Astro Boy, and the Manga/Anime Revolution"--presentation to Japan Foundation. Professor Saya Shiraishi's class @ Tokyo Univeristy, Tokyo, Japan. Discussion about the history of manga translation in North America. Discussion of Tekkon Kinkreet animated film with students, as part of Gorgeous Entertainment's Anime Masterpieces program. Nice review here. Discuss manga and anime with students. Meyer hall, Freer Gallery, Smithsonian Institution, Washington D.C.
Introduction of four animated films in National Cherry Blossom Anime Marathon. Boston Museum of Fine Arts, Boston. Panel discussion with John Dower and Roland Kelts, after screening of Grave of the Fireflies, part of Gorgeous Entertainment's Anime Masterpieces program. Panel discussion with Jason Thompson, in conjunction with "The Many Faces of Manga" exhibit. Washington, DC. Smithsonian Institution, Freer Art Gallery, Mayer Hall, 2pm. Anime Masterpieces series at Smithsonian Institution, Freer Gallery, Mayer Hall. Grave Of The Fireflies Screening And Panel With John W. Dower and Susan J. Napier. Anime Masterpieces series at Waterloo Festival of Animated Cinema. Grave Of The Fireflies Screening And Panel. With Brian Ruh, author of Stray Dog Of Anime, and Central Park Media's John O'Donnell. Anime Masterpieces series at Pacific Film Archives. Screening of Grave of the Fireflies and panel discussion with Roland Kelts, author of JapanAmerica, Susan Napier, author of Anime From Akira to Howl's Moving Castle, and Ian Condry, author of "Hip-Hop Japan: Rap and the Paths of Cultural Globalization." Moderated by Dan O'Neill of UC Berkeley. Panel discussion at LA Times Festival of Books, Los Angeles--"Reading Manga: A Japanese Phenomenon Comes to America." Moderator: Charles Solomon. Other panelists: Lillian M. Diaz Przybyl, editor from TokyoPop, and Liza Coppola, Sr. Vice President, VIZ Media. Presentation on Osamu Tezuka and Astro Boy to Paul Sutcliffe's manga class. "Tezuka Osamu, Astro Boy, and the Roots of Modern Manga and Anime." Cost: Free for JAT members, \1000 for non-members. Tokyo, Japan. Tokyo American Club in Takanaka. Lecture titled: "Manga and Astro Boy the humanoid, Japan's postwar cultural icon," at Japan College Women's Association monthly luncheon program, Tokyo. Details here. University of San Francisco, Main Campus, Xavier Hall, Maraschi Room. "The Anime/Manga Revolution: Osamu Tezuka and 'Astro Boy'"
With Tim Hornyak (and Matt Alt) on Robots in Japanese science and fiction, as part of the"Robotopia Rising Lecture Series" at the Kennedy Center (Millennium Stage) in Washington D.C. Click here for photos. Fremont, California, Mission San Jose High School. Julia Madsen's Japanese language class. Cosponsored by the American Friends Service Committee. San Francisco, Asian Art Museum. Book signing and talk at the Asian, in conjunction with the "Tezuka: The Marvel of Manga" exhibit. San Francisco. Asian Art Museum. Panel discussion on manga with Gilles Poitras, as part of the Blast Off! launch of the "Tezuka: The Marvel of Manga" exhibit. Pics here. Guided tour of "Osamu Tezuka: The Marvel of Manga" exhibit. Cosponsored by the Film and Digital Media Department, Oakes College, and the East Asian Studies Program. Details here. Lecture to museum docents, as part of training session on "Tezuka: The Marvel of Manga" exhibit.